The first nonsectarian cemeteries in NYC. While meandering through the East Village during the spring, I noticed that I was on lower 2nd Ave. near E. Houston St., and hadn’t gotten a decent photo of the New York Marble Cemetery gate and entranceway. It’s one of the more obscure alleyways in New York, and is unnamed because I doubt it ever admits motorized traffic. I found that the gate was open, and what’s more, the gate to its “competitor,” the New York City Marble Cemetery a block or so away, was also open. 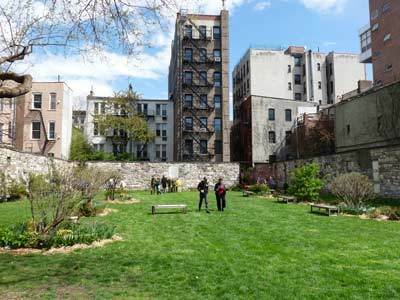 The New York Marble Cemetery is open the fourth Sunday of each month during spring and summer, while the NYC Marble Cemetery is a bit stricter, opening on several selected dates during the year. These are a pair of “neighborhood” cemeteries established by 1831, the first nonsectarian ones in NYC. After the mid-1840s, the city, (erroneously) believing cemeteries would exacerbate disease epidemics such as yellow fever and cholera, legislated against any burials south of midtown; St. Patrick’s parish then established Calvary Cemetery across the river in Queens, for example, and Brooklyn and Queens’ “cemetery belt” came into existence. 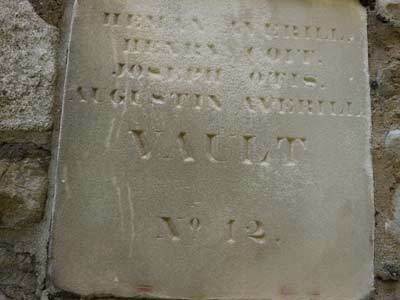 In downtown Manhattan, though, there are still some small cemeteries scattered around, some dating to the 1600s, such as the Trinity Church yard at Broadway and Wall St. The New York Marble Cemetery and New York City Marble Cemeteries were established in 1830 and 1831 respectively, and are considered completely separate entities, though the same individual built them. The NY Marble Cemetery (NYMC) is unique in New York City in that it contains no freestanding gravestones. The NYMC and the nearby New York City Marble Cemetery (NYCMC) were developed by Perkins Nichols, beginning in 1830, when E. 2nd St. was still considered uptown. Instead of earth graves with headstones, family vaults the size of small rooms were built 10 feet underground. The relatively deep location was decided on because at that time there was still fear of contamination from deadly or debilitating diseases from fresh remains. The vaults are set in pairs and can be accessed by removal of stone slabs set beneath the “lawn.” The NYMC contains 156 vaults and 78 entrances. Among the original internees were prominent businessmen, whom today some would call the “one percent.” Uriah Scribner, a founder of the Scribner publishing and book-selling empire; Aaron Clark, NYC’s first Whig mayor (from 1837-1839); U.S. Representative and President of Columbia University, James Tallmadge; Benjamin Wright, Chief Engineer for the Erie Canal; and Deys, Varicks and other prominent names found on NYC street signs. 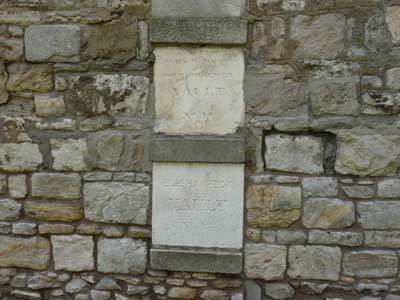 The roughly hewn stone walls of the NYMC contain marble plaques, showing original owners and the precise location of each vault. Tuckahoe marble was employed for the aboveground plaques and lintels and also below ground for the vaults’ walls and arched ceilings, preventing “miasma,” or harmful vapors, from seeping to the surface. Unfortunately, marble doesn’t hold up very well in wind and rain and many of the names, once chiseled deep into the stone, have suffered nearly 200 years of weathering. Next week: On to the New York City Marble Cemetery.